Creating floor plan with free templates and examples. Floor planning has never been easier. Whether you work on your own or with a dedicated team, floor plans give you a bird's-eye view of a space, like indoor rooms and outdoor areas. With an intuitive drag-and-drop interface, keyboard shortcuts, and options for seamless interactivity, your diagramming will be better than ever. Floor plan can help you plan classroom seating; show potential buyers the house layout; design your dream bedroom, kitchen and washroom; arrange your household furniture and display detailed electrical and telecommunications needs. Used for commercial building design, space plans, architectural layout, construction documents, structural diagrams, and facility planning. Used for kitchen and bathroom design, architectural and construction documents, space plans, remodeling, and planning additions. Create floor charts, floor plans, and blueprints for facilities management, move management, office supply inventories, assets inventories, office space planning, and cubicles. Create the plans of bleachers, grandstands and seating. Create elevation diagrams for cabinets, house design and kitchen plan. Create garden design for house, hotel, villa and park, etc. Create fire and emergency plan for house, school, hotel, hospital, restaurant, etc. Create building plan for house, hotel and villa, etc. Create HVAC plan for house, hotel, villa and building, etc. Create security and access plan for house, building, hotel, school and hospital, etc. Create reflected ceiling plan for house, building, hotel, office and shop, etc. Create plumbing and piping plan for house, building, hotel, office and restaurant, etc. Edraw has exhaustive floor plan symbol library and powerful floor plan making tools, allowing you to easily design your own professional-looking floor plan including commercial building design, space plans, architectural layout, construction documents, structural diagrams, and facility planning. It is quick and easy to design floor plans for your home, office, or special event with our software which helps you visualize any project before you begin, then customize to your liking. We have a library of shapes makes it easy to drag and drop furniture, appliances, plants, and more wherever you need them - and to rearrange them whenever you want. Whether you're designing for yourself or a client, you may need to share your floor plans. With Edraw, you can publish, export, and share your designs - and even invite others to edit them. Check out floor plan drawing right here. A vector supermarket floor plan template showing the supermarket layout is ready to use in vector format for your own designs. 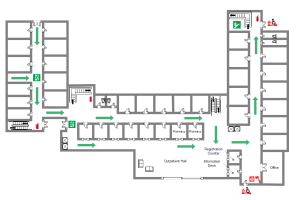 A hospital floor plan example is presented for viewing and referencing. 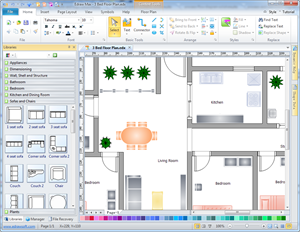 Download and use it as a template for quickly floor plan designing. Learn how to create a floor plan here. You may start to design your own floor plans now! Download free floor plan templates. Click here to learn Fire Escape Plan Software. Protect your family with an Emergency Home Evacuation Plan.